If you are unable to see the Reading Oceans on the main homepage. (Refer to the picture above), please check if you have installed Flash Player on your computer. 2. In the address bar at the top, enter chrome://components and press Enter. 3. Look for "Adobe Flash Player." 4. Click Check for update. If you see "Component not updated" or "Component updated," you're on the latest version. Go back to the page with the Flash content. If it doesn't open automatically, at the top left, click Reload . 2. In the address bar at the top, enter Adobe.com/go/chrome and press Enter. 5. 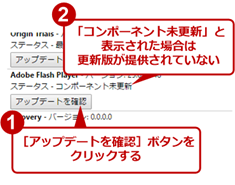 After installation, if you see the picture shown above, continue with Step C.
1.On Reading Oceans Homepage, on the address bar click [ ] icon or click on “Click to enable Adobe Flash Player (shown below) then click allow. A. Ensure that Flash Player is enabled. 1. Open the [www.readingoceans.jp/] in Internet Explorer. 2. Click the [ : Tools] menu, in the upper-right corner of Internet Explorer. 3. Click the [Tools> Manage add-ons] menu. 4. 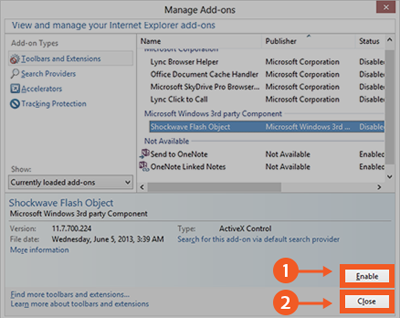 Select [Shockwave Flash Object] from the list. * Note: Ensure that your current website has rich media content. 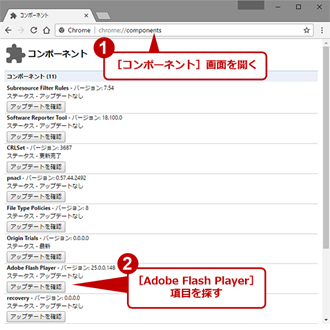 If the current website does not contain rich media content, Shockwave Flash Object doesn't appear in the list. 5. Click Enable, and then click Close. 1. Click the [Tools> Safety > ActiveX Filtering] menu. 2. Close the browser and open it. Then, try to view the content. 1. On your computer, open Microsoft Edge. 2. On the top right-hand corner, click the [ ] icon.